Answers to questions frequently asked about Bananas, United Fruit Company, ca. 1940. WPA Federal Writers’ Project collection, NYC Municipal Archives. It’s an interesting mish-mash of aging newsprint of various sizes with intriguing headlines and odd reporting. It takes a while to browse through because sometimes the stories on the reverse side of the clippings are equally as interesting as the food reporting. The volume isn’t part of the Works Progress Administration files that are the subject of our Feeding the City exhibit. But so much of the content gathered by the Federal Writers Project staff is echoed in the scrapbook. And the news stories quote some of the same sources used by the WPA writers. Much of the information seems odd. Corn brochure, WPA Federal Writers’ Project collection, NYC Municipal Archives. The World’s Largest Grain Crop is U.S. Corn touts one headline. Old-Style Corn to Spruce Up states another atop a story by Clementine Paddleford detailing how a commercial bakery was producing a new corn bread, richer than the corn pone of the old West. Food prices throughout the country, and certainly in New York, fluctuated a great deal. A bulletin issued by the United States Bureau of Labor Statistics in 1942 attributed several shortages of fresh fruit and vegetables to three factors: high consumer demand, heavy purchasing by the U. S. government and poor crops for some items. Another factor would have been pricing. In part to make food more generally available at affordable prices, the Office of Price Administration established price controls. The bulletin stated, “Among the fresh fruits and vegetables price control was first extended to bananas in May, 1942.” Price controls on citrus, potatoes and onions soon followed in October, 1942. Prunes, it turns out, were not generally available to the public because the crop was earmarked for military consumption. Recipe booklet, WPA Federal Writers’ Project collection, NYC Municipal Archives. The nation really got its first glimpse of the banana at the 1876 Philadelphia Centennial, which also was the first World’s Fair to be held in the U.S.A. Taking the country by storm the banana was considered a staple by 1910. By 1937, the country imported ten million bananas annually, “a banana and a half each week of the year for every man, woman and child,” according to the Sun. And by 1942, New Yorkers were dismayed first by the cost and then by the dearth of this favored fruit. The scrapbook documents a food problem during August 1942: the banana shortage. “Virtually every policeman on duty in the Astoria Precinct spent last night in a store-by-store and restaurant-to-restaurant search for bananas for a 21-month old boy suffering from a rare disease, celiac, and today they turned in a total of 23, all they were able to locate.” The officers were attempting to help a Manhattan mother who had been searching for the fruit in vain but heard there might be help in Astoria. 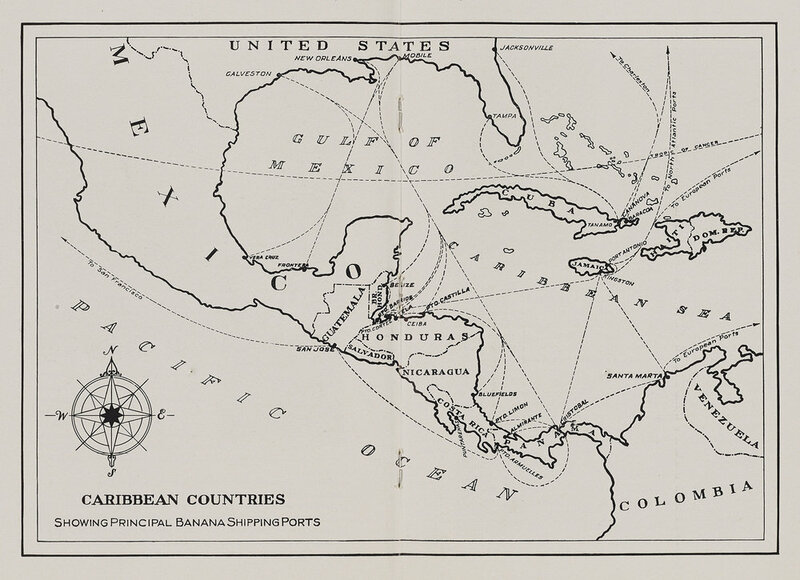 Map of banana trade routes, ca. 1940. WPA Federal Writers’ Project collection, NYC Municipal Archives. The problem, they reported, was that ships that formerly carried bananas were carrying war materials. 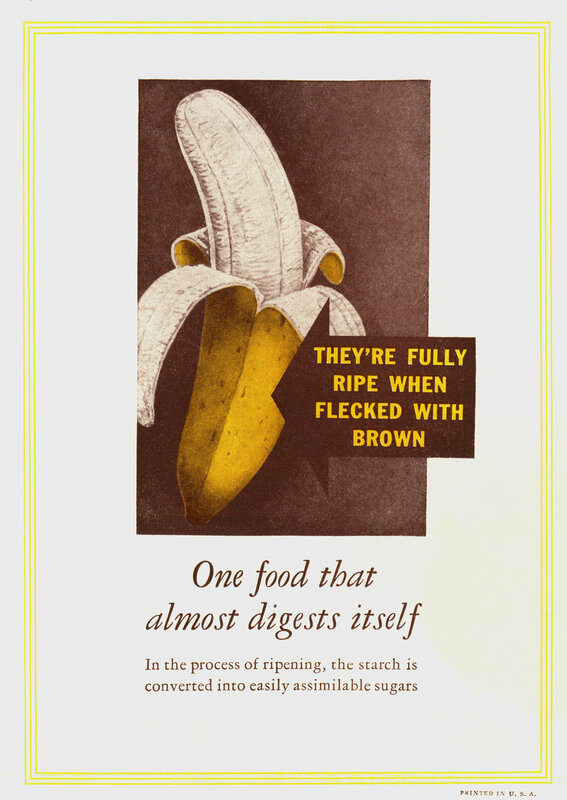 As the number one fruit imported into the United States, the banana was not only tasty but also “an important force for good neighborliness in the Americas.” One must wonder if this slant was influenced by the two major companies that grew and imported bananas—United Fruit and Standard Fruit (now Dole). As the titans in so-called banana republics, the notion of their monopolies leading to hemispheric friendship was part of a public relations campaign. The same story, word-for- word, was also published in the Independent Grocer on August 21st. One can only imagine the joyous shouts from readers of an August 25, 1942 report in the New York Times. For the first time in several weeks, two shipments of bananas were scheduled to arrive in New York. August 25, 1942 report in the New York Times. Mayor LaGuardia collection, NYC Municipal Archives. 264 Washington Street, ca. 1940. Sal Traina’s wholesale shop received an emergency shipment of 24,000 lbs of bananas in 1942. Department of Finance Tax Photo Collection, NYC Municipal Archives. In another clipping, a New York Tribune food column extolled a new development: the availability of dehydrated bananas. By September, bananas were not so newsworthy. The last clip on the topic for the month, a “special cable” to the New York Times on August 28, reports on the end of banana contracts. The company cancelled all contracts with growers in Costa Rica because of shipping issues. There were no bananas that day.